[C]ommitted investors should make a list of companies that they really like, know about, and want to own – at the right price. If the shares of those firms are too high, put in limits, possibly 20-30% below current levels, and wait. Don’t let cash burn a hole in your pocket – let the stocks come to you, and don’t chase. Within a day of publishing Jim’s piece, my friend Vitaliy Katsenelson’s quarterly letter to clients landed in my inbox, and I thought it would make a good follow-up to Jim’s article. Vitaliy is one of today’s most outstanding value investors – he’s the author of Active Value Investing and The Little Book of Sideways Markets; he’s a regular speaker at events around the annual Berkshire Hathaway meeting in Omaha; and he stages his own excellent VALUEx Vail event every summer. We spend little time trying to predict the next recession, and we don’t try to figure out what prick will cause this market to roll over. Our ability to forecast is very poor and is thus not worth the effort. What he does know is a lot about value investing in trying times – I mean, wouldn’t you say the past two decades have been trying times for value investors, all things considered? Vitaliy’s is just one of the wise perspectives I’ll be sharing with you, along with my own, as we all gird up for the Great Reset in our future. I’m enjoying being at home and not traveling. Shane is cooking most of our meals, so I’m eating healthier and losing a little weight. It’s tough to maintain your weight out on the road, and that means I have to make an even bigger effort when I’m home. Vacation for me is actually being in one spot for a period of time, so the last few weeks and the next few are almost like a vacation, except that I’m constantly in front of my computer and on the phone. And speaking of the computer, my inbox is calling, so I will conclude this and wish you all a great week. We are having a hard time finding high-quality companies at attractive valuations. For us, this is not an academic frustration. We are constantly looking for new stocks by running stock screens, endlessly reading (blogs, research, magazines, newspapers), looking at holdings of investors we respect, talking to our large network of professional investors, attending conferences, scouring through ideas published on value investor networks, and finally, looking with frustration at our large (and growing) watch list of companies we’d like to buy at a significant margin of safety. The median stock on our watch list has to decline by about 35-40% to be an attractive buy. But maybe we’re too subjective. Instead of just asking you to take our word for it, in this letter we’ll show you a few charts that not only demonstrate our point but also show the magnitude of the stock market’s overvaluation and, more importantly, put it into historical context. Each chart examines stock market valuation from a slightly differently perspective, but each arrives at the same conclusion: the average stock is overvalued somewhere between tremendously and enormously. If you don’t know whether “enormously” is greater than “tremendously” or vice versa, don’t worry, we don’t know either. But this is our point exactly: When an asset class is significantly overvalued and continues to get overvalued, quantifying its overvaluation brings little value. Let’s demonstrate this point by looking at a few charts. The first chart shows price-to-earnings of the S&P 500 in relation to its historical average. The average stock today is trading at 73% above its historical average valuation. There are only two other times in history that stocks were more expensive than they are today: just before the Great Depression hit and in the1999 run-up to the dotcom bubble burst. We know how the history played in both cases – consequently stocks declined, a lot. Based on over a century of history, we are fairly sure that, this time too, stock valuations will at some point mean revert and stock markets will decline. After all, price-to-earnings behaves like a pendulum that swings around the mean, and today that pendulum has swung far above the mean. What we don’t know is how this journey will look in the interim. Before the inevitable decline, will price-to-earnings revisit the pre-Great Depression level of 95% above average, or will it maybe say hello to the pre-dotcom crash level of 164% above average? 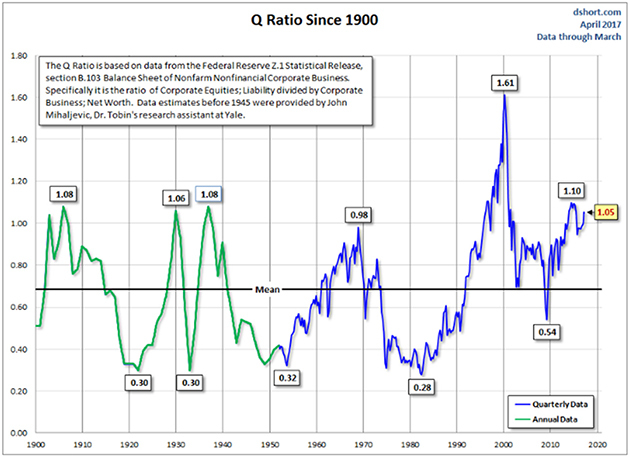 Or will another injection of QE steroids send stocks valuations to new, never-before-seen highs? Nobody knows. One chart is not enough. 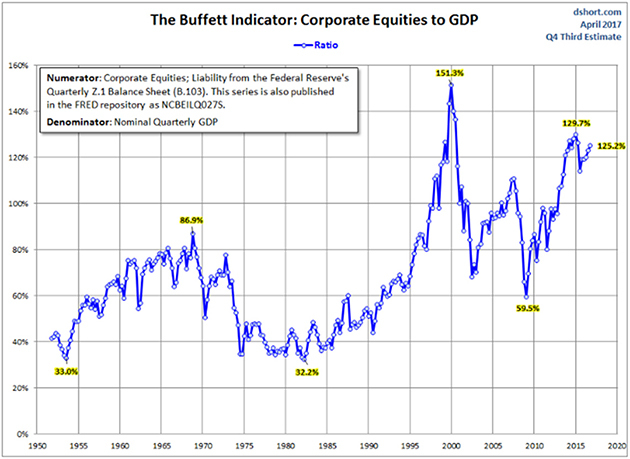 Let’s take a look at another one, called the Buffett Indicator. Apparently, Warren Buffett likes to use it to take the temperature of market valuations. Think of this chart as a price-to-sales ratio for the whole economy, that is, the market value of all equities divided by GDP. The higher the price-to-sales ratio, the more expensive stocks are. Both Mike and Vitaliy were investing during the 1999 bubble. (Mike has lived through a lot of more bubbles, but a gentleman never tells). We both vividly remember the “This time is different” argument of 1999. It was the new vs. the old economy; the internet was supposed to change or at least modify the rules of economic gravity – the economy was now supposed to grow at a new, much faster rate. But economic growth over the last twenty years has not been any different than in the previous twenty years – no, let us take this back: it has actually been lower. From 1980 to 2000 real economic growth was about 3% a year, while from 2000 to today it has been about 2% a year. Finally, let’s look at a Tobin’s Q chart. Don’t let the name intimidate you – this chart simply shows the market value of equities in relation to their replacement cost. If you are a dentist, and dental practices are sold for a million dollars while the cost of opening a new practice (phone system, chairs, drills, x-ray equipment, etc.) is $500,000, then Tobin’s Q is 2. The higher the ratio the more expensive stocks are. 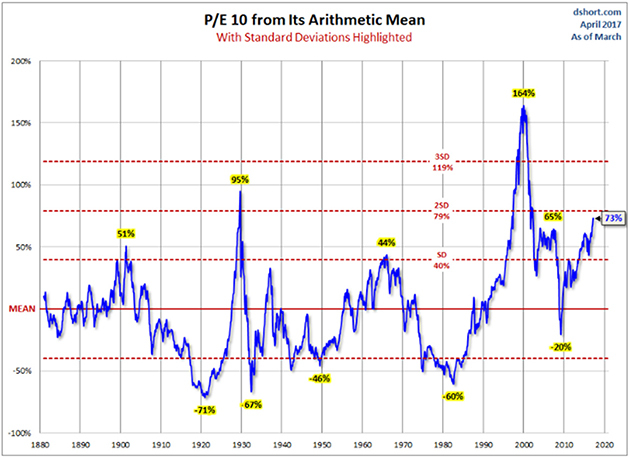 Again, this one tells the same story as the other two charts: Stocks are very expensive and were more expensive only twice in the last hundred-plus years. What will make the market roll over? It’s hard to say, though we promise you the answer will be obvious in hindsight. Expensive markets collapse by their own weight, pricked by an exogenous event. What made the dotcom bubble burst in 1999? Valuations got too high; P/Es stopped expanding. As stock prices started their decline, dotcoms that were losing money couldn’t finance their losses by issuing new stock. Did the stock market decline cause the recession, or did the recession cause the stock market decline? We are not sure of the answer, and in the practical sense the answer is not that important, because we cannot predict either a recession or a stock market decline. In December 2007 Vitaliy was one of the speakers at the Colorado CFA Society Forecast Dinner. A large event, with a few hundred attendees. One of the questions posed was “When are we going into a recession?” Vitaliy gave his usual, unimpressive “I don’t know” answer. The rest of the panel, who were well-respected, seasoned investment professionals with impressive pedigrees, offered their well-reasoned views that foresaw a recession in anywhere from six months to eighteen months. Ironically, as we discovered a year later through revised economic data, at the time of our discussion the US economy was already in a recession. An argument can be made that stocks, even at high valuations, are not expensive in context of the current incredibly low interest rates. This argument sounds so true and logical, but – and this is a huge “but” – there is a crucial embedded assumption that interest rates will stay at these levels for a decade or two. Hopefully by this point you are convinced of our ignorance, at least when it comes to predicting the future. As you can imagine, we don’t know when interest rates will go up or by how much (nobody does). When interest rates rise, then stocks’ appearance of cheapness will dissipate as mist on the breeze. And there is another twist: If interest rates remain where they are today, or even decline, this will be a sign that the economy has big, deflationary (Japan-like) problems. A zero interest rate did not protect the valuations of Japanese stocks from the horrors of deflation – Japanese P/Es contracted despite the decline in rates. America maybe an exceptional nation, but the laws of economic gravity work here just as effectively as in any other country. Finally, buying overvalued stocks because bonds are even more overvalued has the feel of choosing a less painful poison. How about being patient and not taking the poison at all? You may ask, how do we invest in an environment when the stock market is very expensive? The key word is invest. Merely buying expensive stocks hoping that they’ll go even higher is not investing, it’s gambling. We don’t do that and won’t do that. Not to get too dramatic here, but here’s how we look at it: Our goal is to win a war, and to do that we may need to lose a few battles in the interim. Yes, we want to make money, but it is even more important not to lose it. If the market continues to mount even higher, we will likely lag behind. The stocks we own will become fully valued, and we’ll sell them. If our cash balances continue to rise, then they will. We are not going to sacrifice our standards and thus let our portfolio be a byproduct of forced or irrational decisions. We are willing to lose a few battles, but those losses will be necessary to win the war. Timing the market is an impossible endeavor. We don’t know anyone who has done it successfully on a consistent and repeated basis. In the short run, stock market movements are completely random – as random as your trying to guess the next card at the blackjack table. However, valuing companies is not random. In the long run stocks revert to their fair value. If we assemble a portfolio of high-quality companies that are significantly undervalued, then we should do well in the long run. However, in the short run we have very little control over how the market will price our stocks. Our focus in 2016 was to improve the overall quality of the portfolio – and we did. We will stubbornly continue to build a portfolio of high-quality companies that are undervalued. The market doesn’t need to collapse for us to buy new stocks. The market falls in love and out of love with specific sectors and stocks all the time. In 2014 and 2015 healthcare stocks were in vogue, but in 2016 that love was replaced by a raging hatred. We bought a lot of healthcare stocks in 2016. In the first quarter, REITs as a group were decimated and we bought Medical Properties Trust (MPW) at less than 10 times earnings and a near 8% dividend yield – more on that later. We also spend a lot of time looking for stocks outside the US, in countries that have a free market system and the rule of law. The point we want to stress is this: We don’t own the market. Though the market may be overvalued, our portfolio is not. Vitaliy N. Katsenelson, CFA, is Chief Investment Officer at Investment Management Associates in Denver, Colo. He is the author of Active Value Investing (Wiley) and The Little Book of Sideways Markets (Wiley). To receive Vitaliy’s future articles by email or read his articles, click here. June 10, 2017, 12:07 p.m. I have different mutual funds that invest in stocks worldwide. The % is at least twice what I should have at my age, 81. I feel I have no choice. I keep finding ways to save more money to get ready for the big one. I have full control of my weight 165 lb (6’1”) which never varies more than a pound or two since I changed to a vegetable, dairy, salmon diet. No grain products like cereal, spaghetti, because they cause sugar levels to spike as high as 160, and then you are hungry again after two hours. No meat (may cause cancer). No processed foods, canned foods, desserts and other sugar added foods which contain unhealthy ingredients. No drinks like coke and sports drinks, no diet drinks. No cheat meals and no cheat foods (Must be less than occasional). My biggest weight loss occurred after I stopped eating all grains products. That sugar spike may be true. Snuffy Meyers, M.D., Charlottesville VA gives much of this advice which is necessary to stop and avoid prostate cancer, and also heart disease and other cancers. Dr. Meyers successfully treats the worst kinds of prostate cancer. I also shoot basketball and keep running after missed shots in a court up to one hour a day. Beats the boredom of running on a track or treadmill, or using the other cardio devices. Plus, I am learning to shoot better than I did 66 years ago. I also lift weights up to one hour a day, and frequently do floor exercises on days off from the weights. I sometimes wonder if my weight control is caused by exogenous factors involving a developing cancer. I will get this checked out by Dr. Meyers.